Here’s a 30 minute dinner recipe idea which uses ingredients you would probably have on hand. 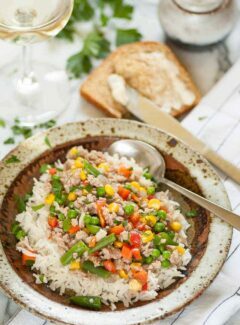 I made a ground pork gravy and added mixed vegetables and served the dinner on rice. Mixed veggies…in the freezer. Ground pork, (or could be beef), in the freezer. This is the kind of thing to make when you don’t want to go to the store. Use what you have on hand. And, luckily, MaryJo made some delicious wheat bread to go with. Start out by chopping up an onion, (there’s generally an onion on hand). Then a bell pepper if you have one. Doesn’t matter what color. I had a red one, but green or yellow would be fine. Mince a couple of garlic cloves too. Grab a large, high sided skillet and add 1 or 2 tablespoons of vegetable oil and get the chopped ingredients softening up. After 3 or 4 minutes add the ground pork and cook it until it’s done, like 8 minutes. 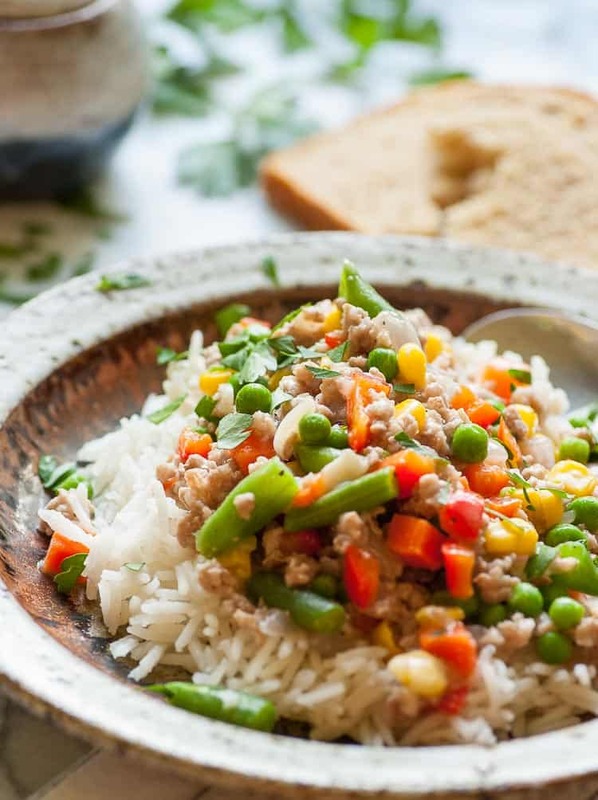 While the meat and veggies are being cooked, start the rice. I always use the pasta method when cooking rice. Use a large saucepan and add the cup of rice then add 4 or 5 cups of water. When the rice is done, use a wire strainer to stain away the excess water. This ensures perfectly cooked rice without worrying if the water is going to boil away and you end up with burnt rice. On with the gravy part: Add 3 tablespoons of all purpose flour to the pork and stir it in well. Let it cook for 2 minutes, then stir in the broth. Scrap up any brown bits that may be on the bottom of the skillet. Bring this to a boil, then add the frozen mixed vegetables. Turn the heat down and let the veggies get heated through. Hey guys….this meal is done and ready to be served. 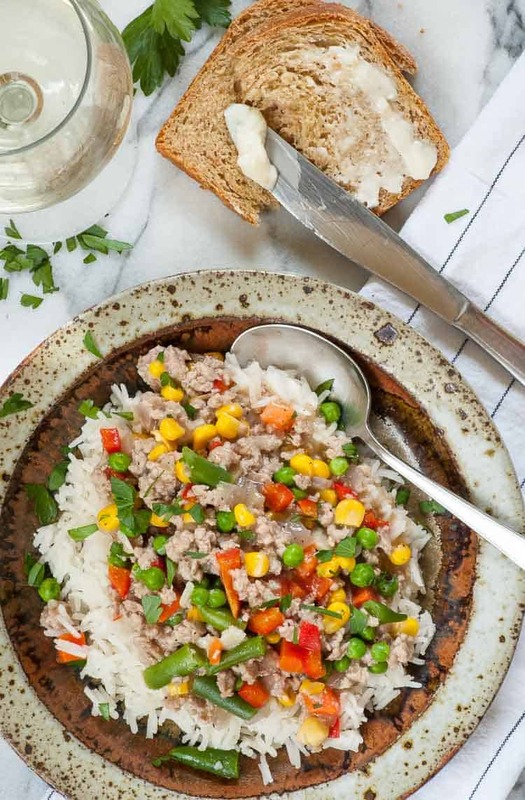 I topped the rice with the pork gravy, but you may want to just mix the rice in with the ground pork with vegetables gravy and serve it that way. Either way it’s a winner. This is a 30 minute meal to prepare when you're in a rush. Use what you have on hand for this tasty dinner. Cook the rice in a large saucepan, using the pasta method, approximately 12 minutes until the rice is cooked through. Drain and keep warm. In a large, high sided skillet add the vegetable oil, onion, bell pepper, garlic, salt, pepper, and the spice mix on medium heat and soften for 3 to 4 minutes. Add the ground pork and cook thoroughly about 8 minutes, breaking it up into small pieces. Add the flour and stir to combine and let cook 2 minutes. Then stir in the broth and bring to a boil to thicken. Next, add the frozen vegetables, reduce the heat and let the vegetables heat up stirring occasionally, 4 to 5 minutes. Taste and adjust the seasonings as desired. 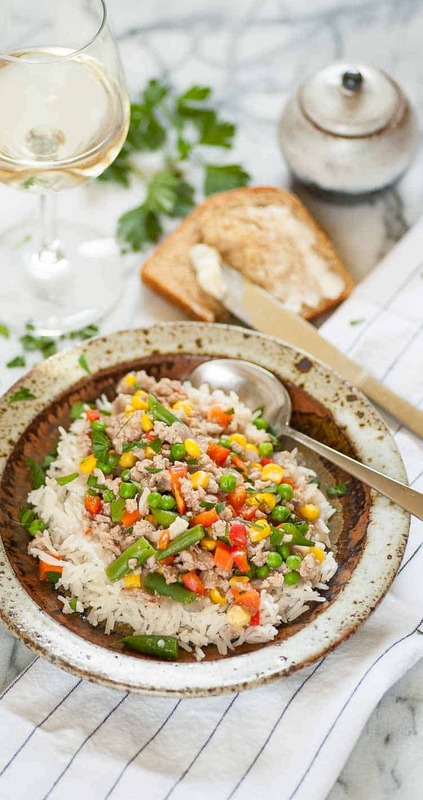 Serve the ground pork gravy over rice or mix it all together and serve hot. Penzeys Parisien contains chives, dill weed, basil, tarragon, chervil, and white pepper. Any mix of spices like this will up the flavor of the dish.